A friend of mine suffered a broken piece of jewelry. She loved the stone but the ring was far too fragile to hold up under the riggers of using her hands on a daily basis. She is a professional body worker and required a design strong enough to withstand pushing muscles, moving equipment and a lot more. The goal was to create a durable ring of elegant design ~ reflecting her love of health an beauty. 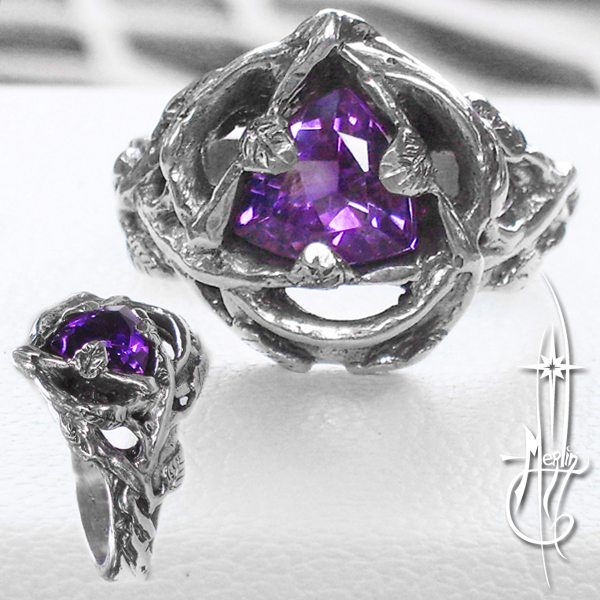 The result: a custom, one-of-a-kind Garden Ring of Amethyst and Sterling Silver. Vines wrap around the stone with leafy foliage winding down the shank. The ring has many hidden open voids to allow light to bounce around the stone: set into a sculpted cage of leaves, prongs textured with veins. The shape of the stone (a triangle) is focused to “extend” beyond the hand, allowing the flow of design to harness the shape of the stone. Now in a private collection – no mold was taken for reproduction: truly a unique ring. If you want something like it, please visit my how to order custom page. Be sure to visit my Website: Amulets by Merlin and see my collection of rings!